Citavi is compiling the bibliography at the end of the document in an order that is not alphabetical. This has never happened to me before. How can I ask Citavi 4 to alphabetize the bibliography? could you please let us know which Citation Style you are using? I am using Chicago 16th ed. (author-date). Also, Citavi is working very slowly in my computer, it takes a couple of minutes to unfreeze the document after I add or delete a citation. I wonder whether these two issues are related at all? 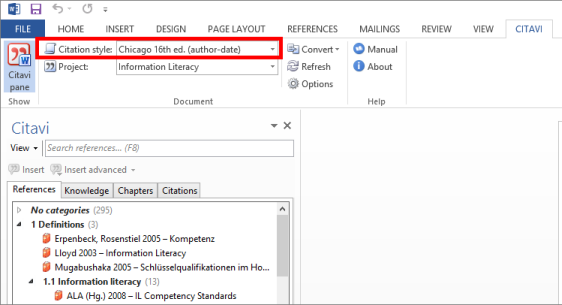 In addition, in Word on the Citavi ribbon, please click Refresh. If the sorting in the bibliography continues to look strange after that, please send us the Word document (or a test document) so we can take a closer look. To transfer the file, please use our secure upload service. So that we can match the files to the issue, please put the address of this page in the message field. I looked for updates and there is a message that reads: "You are using Citavi Pro 4.4.0. You do not need to update"I therefore sent you the document through your secure upload service. A macro in the Chicago author-date style was throwing an error on this user's computer. We've since modified the style and removed the macro, so this error should no longer occur. If you experience a similar problem with your bibliography sorting, please submit a ticket describing the error and the style you are using.